ABOVE: Caitlin Neveadomi snuggles with Noah, her miracle baby, in their Vacaville home. Caitlin Neveadomi and her husband Brandon never thought having a baby would be so complicated. They’d been trying for months to get pregnant, with the attitude of “if it happens, it happens.” But it wasn’t happening. The NorthBay Health at Home nurse had headaches that were nonstop. “It felt like a sledgehammer in the back of my head,” she remembered. She attributed it to stress. Then she started getting pain in her neck and shoulders. She decided to see a doctor. NorthBay Medical Center became a Baby Friendly facility in 2014. That means the team does everything it can to encourage the healthiest start for babies, which includes breastfeeding. Lactation consultants have raised the exclusive breastfeeding rate up to 70 percent for all babies born at NorthBay Medical Center. Obstetrician-Gynecologist Rachel Villalon, M.D., ran a whole battery of tests, but it just wasn’t adding up. Blood tests came back with suspicious levels of prolactin. Finally, Dr. Villalon called for an MRI. The results sent Caitlin to neurosurgeon Edie Zusman, M.D., where she learned surprising news. She had a chiari malformation — a rare condition in which brain tissue extends into the spinal canal. Dr. Zusman ordered a series of MRIs, including a state-of-the-art CSF flow study, which is used to observe cerebrospinal fluid flow. “We agreed I would hold off on trying to get pregnant until we got all the images back and formulated our plan,” said Caitlin. Once Dr. Zusman determined that brain surgery was an option, Caitlin started watching videos online of similar surgeries. The surgery is designed to create more room at the cerebellum in the back of the brain. Proud parents Caitlin and Brandon Neveadomi are enjoying every minute they can with baby Noah. “The procedure is meticulously performed with computer guidance and the operating microscope to reestablish normal flow and alleviate the plugging effect and pressure buildup associated with severe headaches,” explained Dr. Zusman. She was told two to three months. She cried the first time she woke up after surgery and DIDN’T have a headache. “It was the first time I didn’t have to take an aspirin in a very long time,” she recalled. Within two days of the surgery, she was headed home, ready to exercise and get into shape for pregnancy. 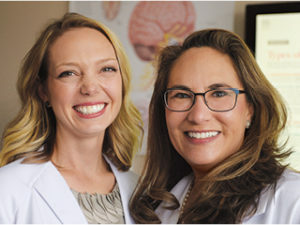 NorthBay “gave birth” to the Center for Women’s Health in 2010, bringing together providers with specialties in obstetrics and gynecology to handle women’s issues, from teen years through menopause and beyond in the Gateway Medical Plaza in Fairfield. In 2018, the A Baby’s Coming Prenatal Program — just across the hall on the third floor — was folded into the Center for Women’s Health, thus serving all pregnant patients under one program, with prenatal visits, a registered dietitian and the Sweet Success program for gestational diabetes. The best part, she said, came exactly two months after surgery when she and Brandon found out she was pregnant. She knew from the beginning that she’d need to have a caesarian section, to minimize pressure on her brain. What she didn’t know was whether Dr. Villalon would be there to deliver — because after all, she was pregnant, too. And timing is everything. Fortunately, Dr. Villalon had already returned to work by the time Caitlin went into labor on Sept. 30. And even better, Dr. Villalon came in on her day off to deliver Noah — who weighed in at 7 pounds, 8 ounces. It was a reunion of sorts when Dr. Villalon and Dr. Zusman got together with Caitlin and Noah for the Wellspring cover photo shoot in January. “Wow, he’s grown so fast,” said Dr. Villalon, admiring young Noah. Caitlin and her husband Brandon couldn’t be happier for all the care she received, when she needed it most. Patients who once had to travel out of the county for sophisticated treatment of complex neurological conditions now receive care close to home, thanks to the development of the Center for Neuroscience. The center includes a stroke program, a spine program, a team of neurosurgeons and neurologists who handle everything from brain tumors and aneurysms to epilepsy and Parkinson’s Disease.